You are correct puniet but on the contrary I would prefer having RTG with some other fish which would have a low profile and be a target rather than FH. Just think about the tank's status when all five FH reach atleast 10". IMHO the main problem with having more than one similiar CA cichlid is that they never be in harmony at any point of time. And having them with the RTG will always be like having my heart in my mouth and waiting for the inevitable . But as Mahek as mentioned that it is a 4.2 feet tank they might be a bit disciplined for atleast a month or two. Bro, I am keeping my fingers crossed nd I am quite hopeful that I can get to see the FH nd RTG living in peace bocs as I said it all in the genes nd my monsters are not in fr war yet at least fr the last 02 months. In fact I had a 8" tiger oscar in the sme tank about a week back but one of my friend wanted to buy it so had to give him away. Lastly fishkeeping is all about trial nd error nd creating the best setup fr your fishes so if they are Happy we are Happy. hey Puniet how is the feeding going on?? why don't you try feeding MP / SW/ MW. feeding MP / SW/ MW. Mahek, the above said abbrevations don't trigger my brain cells. I tried a couple of combinations as to what they would mean but couldn't reach to a logical meaning.MP could stand for Member of Parliament, but I don't think a 6 inch aro can eat one :lol: :wink: . So would you mind elaborating them for me. The aro, enjoys beef heart and my family and myself have noticed that it has grown a liltle under a inch in 15 days that we had him. I can always go for variety of foods, so please tell me what MP SW MW mean. Talking of food, I remember seeing on a couple of occasion sign boards saying "Fish eggs for sale" in front of a few farm houses. They don't call them eggs actually, the actual advertisement goes like this " Yahan Machli ke beej milte hain" which literally translates to Fish seeds are available here. Don't know what species eggs are they; I was thinking if one could raise them as feeder fish. Anyone with hands on experience with this? Mate I have a small advice. My brother has a 2 feet silver arowana.He kept about 10 pairs of quarrymores with it .We thought they would dissapear with in 2 days but they were left un touched.We inquired the local LFS wallah about it and he said that arowanas dont feed on quarrymores whatever may thier size. Also they are too fast for the arowana.
" Yahan Machli ke beej milte hain"
These are in all probability not fish eggs, but rather fingerlings (i.e. juveniles 1-3" in length) of carp (think rohu, catla, mrigal etc). Thanks. Market prawns I understand can be purchased from the market. Even if these are fry of carps, do you think one can use them as a feeder for aros and other fish. Yes quarrymores do exist.They are also called quarrys.I also searched google but could not find any link.If I can I will send you some pics. 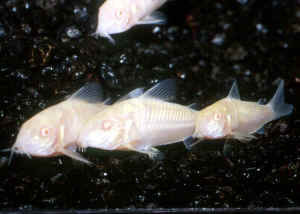 yes the fish in the link I posted are albino Corydoras aeneus...Corydoras was the closest approximation I can think of to "quarrymores"... anyone else have any ideas?? How do Quarries look like? Maybe we could guess then! Are Corys not quarymores? I thought Rahul hinted that. But I guess I overlooked the "??" Albino says his bro kept quarymores with an aro. Now, assuming corys and qaurrys to be same then what experts have to say on this. Personally I cannot imagine, finding a single one alive after few days in the aro tank. They are so small, even a juvenile aro can eat them. Albino pls make the situation clearer. Cories can zip around if needed.